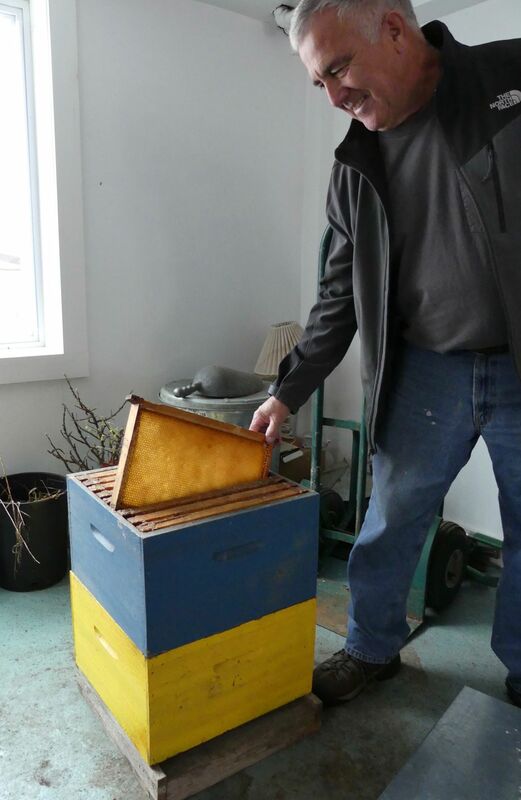 John Mailloux, owner of Weeping Pine Farm & Apiaries in Williamstown, talks about a honey extractor, shown here, that he uses for his business. Vermont’s beekeepers are forging ahead into 2019 despite some challenges the industry faces. Beekeeper John Mailloux, of Williamstown, displays a hive. For Vermont’s 755 registered beekeepers, 2019 is both the best of times and the worst. The best because each year more Vermonters want locally grown, healthy foods such as Vermont-produced honey. The worst because Varroa mites and related viruses are killing bees at astonishingly high rates. Keeping hives operating is a growing challenge, and not for the easily discouraged. Fred Putnam, the owner of Busy Bee Honey in Brandon, said the winter kill rate for some operators, especially for hobbyists, can be 75% or higher. Putnam expects to lose 20% to 30% of his bees over this past winter, which he said is a good year in beekeeping. Putnam, like most beekeepers in Vermont, is a part-timer, as he also works as a personal trainer in Middlebury. His long-term goal is to be a full-time beekeeper, but to get there will be a gradual process. He has been in the business for four years. According to Putnam, beekeepers who have been in the business a long time talk about the craft as “before Varroa mites and after.” The die-off of America’s honeybee colonies started in the 1980s, when Varroa mites were introduced to North America from Europe. Bill Mares, a part-time beekeeper in Burlington who has been in the business for over 40 years, said before Varroa mites beekeepers typically lost 5% to 10% of their bees each year. Today, professional beekeepers routinely lose 30% to 40% of their bees, he said. “We’re in the middle of a perfect storm, between the Varroa mites, global warming, pesticides and the loss of ranges for the bees, the losses are the worst I’ve ever seen,” he said. Jack Rath, president of the Vermont Beekeepers Association, said Varroa mites and the viruses related to them are “the biggest challenge” facing beekeeping and are “responsible for the most losses” in the industry. The University of Vermont has just received an anonymous $500,000 gift to its Gund Institute for Environment to offer grants to local, national and international projects by nonprofit entities to determine if the bee kill can be stopped. John Mailloux, owner of Weeping Pine Farm & Apiaries in Williamstown, agrees that Varroa mites are the worst problem ever faced by beekeepers, but said challenges are not new to the industry. Mailloux, who grew up on a bee farm in Ferrisburgh, has been a “sideliner” (part-timer) in the business his whole life. In the 1960s his parents operated 1,100 hives in Addison County, one of the largest operations in the state at that time. Over that decade their harvest dropped from 80,000 pounds of honey to 8,000 pounds, mostly due, he said, to changes in agriculture practices. In the early 1960s most of the farms near his parents’ bee operation let their cows graze in their fields and cut the hay after it was fully mature. Then some farmers started keeping the cows in the barns and replacing the grass with corn, which doesn’t produce nectar, and started cutting the hay earlier, too early for the bees to produce honey. “Beekeeping has always been a challenge,” he said. What keeps him going is his love of the bees. “Bees are absolutely fascinating. They are the most incredible creatures I have ever come across,” Mailloux said. Kirk Webster, owner of Champlain Valley Bees and Queens in New Haven, agrees with Mailloux. “The bees are the color, everything else is black and white,” he said. Webster has been an outspoken opponent of the practices of the large national honey producers, which he said are part of the problem. He maintains several hundred colonies that he uses for honey production on land that is owned by local author and environmental activist, Bill McKibben. Webster has a lifetime lease on the property. To him, pesticides, pollutants and loss of habitat and forage are bigger problems than the Varroa mites. “The loss of the habitat and poisoning of the environment are the bigger problem,” he said. He calls the huge industrial farms of the Midwest “the corn and soybean juggernaut,” and says those farms have greatly contributed to the decline in the bee population. This January, Webster published an online article titled: “Collapse and Recovery: The Gateway to Treatment Free Beekeeping.” In the article he wrote that “collapse and recovery cycles” are common with beekeeping. “The people who have succeeded in keeping a productive apiary for many years without treatments have all figured out their own patterns and methods based on their own unique situations,” he wrote. One-third of every bite of food is pollinated by bees and other insects, according to David Tremblay, state apiarist for the Vermont Agency of Agriculture. “Insect pollination, including that done by managed honey bees, is a critical ecosystem service that would be impossible to duplicate,” Tremblay said. Beekeepers are a tightly knit group, according to VBA president Rath. Most beekeepers know each other and often help each other improve their operations. Rath, a veterinarian and bee enthusiast, lives in Pawlet and is one of the owners of Betterbee of Greenwich, New York (just west of the Bennington County line), a full-service beekeeping operation that does everything from making honey to selling bees. He divides beekeepers into three groups: the hobbyist, by far the biggest number; the side-liners; and the handful of large commercial operations such as Champlain Valley Apiaries. The key to success in beekeeping, Mailloux said, is to do it right. “There is a steep learning curve. It is important that beginners know what they are doing and have patience,” he said. This article has been updated to eliminate an error regarding a study by researchers from the University of Vermont and the Vermont Center for Ecostudies.